Locus Map Watch add-on for wearables has been available for a few months now, gaining bigger and bigger popularity among Locus Map users who own Android Wear or Wear OS devices. However, many outdoor fans use wearables made by Samsung. Those, alas, haven’t been so lucky – Samsung wearables Gear S(X) and Galaxy Watch run on Tizen – a completely different operation system than Android Wear/Wear OS devices and therefore we had to develop the add-on on an absolutely different platform. To be honest, it was a struggle but in the end we won the battle and Locus Map Watch for Gear and Galaxy watches is finally here! Both add-on versions are, of course, for FREE. If you use Locus Map Free and you install, by accident, Locus Map Pro Watch, don’t worry – you don’t have to purchase Locus Map Pro. Just uninstall the wrong add-on and install the right one – Locus Map Free Watch. Map, track recording controls or navigation right on your wrist! Each sports freak needs to monitor something else. One needs to check his average speed, another one his HR, cadence or elevation gain. We added a lot more, including energy consumption or battery status. Not all values fit in the small watch screen so the dashboard can be rolled down. And what’s more, the dashboard cells can be customized – you can select what values you need to see on what position. Just long tap the cell and confirm your selection from the vaste range of features. So, what are you waiting for? Go to Galaxy Apps and install! Do you have plans to make add on for Huawei’s LiteOS watches? I’m afraid not. Now we are working on Garmin addon and improvement of Wear OS and Tizen addons. Hi, please, contact us at help.locusmap.eu and give us more information – what watch do you use? Describe the problem in greater detail etc. Mám nainštalovanú pro verziu v mobile aj v hodinkách,ale keď ju spustím tak mi neukazuje mapu. Hi, excellent addition this LocusMap addon. What i’m missing (or not seeing) is the availability of an offline map on my smartphone and still navigate on it with my watch. I don’t need to have the map offline on the watch , since it’s already on the phone, but that would help me prepare for the holidays, download the maps in advance and then navigate with them when i’m in the forest/hills without too much network availability. I have the new Galaxy Watch Active. I only see Locus Watch Free in the Galaxy Watch store, Locus Watch Pro is not there. Any ideas? That’s exactly what I was missing. You are doing an excellent job. Keep it up! Thanks a lot! Locus Map Pro auf der Samsung Watch meldet immer “No response from Locus Map”. auch Deinstallation und erneuter Installation. Auf meinem Samsung Note 9 habe ich ebenfalls Locus Map Pro installiert. Was mache ich falsch? spusťte navigaci v Locusu na mobilu, aplikace v hodinkách vám bude zobrazovat trasu a navigační příkazy. Wann kommt Watch Add on für Garmin Watches? to be very optimistic, we expect it some time in April. Dobrý den, přidávám se k dotazu Zdenka z 16.1.2019. Je šance na Locus Map Watch pro Xiaomi Amazfit? Jinak velké díky za Locus. a add-onu pro Xiaomi neuvažujeme. Do dubna by měl být hotov doplněk pro Garmin, jinak budeme pracovat pouze na Wear OS a Tizenu. But where can I find the add-on for galaxy???????? I want to start the Locus Map Pro Gear add-on to record my trip instantly. Should I start my Locus Map Pro app on my phone first or this is the add-on which starts the app even if the phone is in “sleep” ? Huge step forward!!!! Can not wait to have stand alone app on my Galaxy Watch LTE!!!!!! You are doing great job guys, my respect! Hne locus pro installiert Finde watch pro nicht habe eine samsung watch s3 wie installieren? go to your phone settings > applications > Samsung System Accessories > delete its data. Then restart Locus map Pro. It should help. Áno, je zapnutý a nejde to..
Zkontrolujte také, zda máte aktivní bluetooth. Máte v hodinkách odpovídající add-on, tedy Locus Map Free Watch? Jděte do nastavení vašeho telefonu > aplikace > najděte aplikaci Samsung System Accessories a smažte její data. Pak restartujte Locus Map v mobilu a na hodinkách. eure App ist genial. Ich habe das Programm ohne Probleme auf einer Samsung Galaxy Watch installiert und bin begeistert. Genau das hat bisher gefehlt, das lästige herausnehmen des Handys auf einer Tour entfällt jetzt weitgehend – vielen Dank dafür. Prečo mi na hodinach Samsung Galaxy watch stale vypisuje no connection to Locus map vo free verzii? Dobrý den, a máte zapnutý zároveň Locus Map Free v mobilu? Ich benutze Lochs Pro auf einem Samsungs Xcover 4 und einer Gear S3. Ich musste nicht nur den Cache, sondern die gesamten Daten der genannten App löschen, dann hat es sofort funktioniert. Danke für die Anpassung an Tizen! Ich habe die PRO Version erfolgreich und begeisternd auf dem Galaxy S7 laufen. Trotzdem klappt die Verbindung mit der Gear S3 Frontier nicht. In der Free Version funkioniert es mit der Gear S3 Frontier. Gibt es Tips oder Ideen woran das liegt? Work this Add-on with Samsung Gear S3 Frontier? Hello, I will buy a Samsung Gear S3 Frontier. Will Locus work on it? Work with these Add-on only? Hello, I have a xiaomi Redmi 4x. Galaxy app store will not run. How do I get locus map pro watch on my phone. is there a link for this addon? Hi Reiner, Locus Map Pro Watch is a software for your watch, not for your phone. So, go to Galaxy Apps on your watch and install it on your watch. Will it be available on Samsung Gear 2 Neo watch, please? and Which versions of Tizen are supported from? Gear 2 Neo won’t be supported. Locus Map Watch is available on S2, S3 and Galaxy Watch. I have a Locus Map Pro installed at my Android smartphone and wanted to buy a Galaxy Watch and install Locus Map Pro Watch. Is there a way to download maps to the Galaxy Watch, like I have at my smartphone and use them Off line please? I want to leave my smartphone at home and use just Galaxy Watch with offline maps. 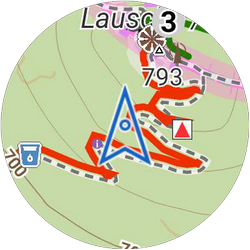 Locus Map Pro Watch is just an extension of your Locus in your Android Smartphone so it doesn’t work without it. It’s not a standalone app. Maybe in future we’ll develop one but for now, there’s only Locus Map Watch extension available. Thanks for understanding. Will it be available on Samsung Fit2 watch, please? I’m afraid not. Fit2 runs on an old version of Tizen and doesn’t have the control ring so we would have to adjust the app just for this one type of band. I don’t find “Locus Map Pro Watch” in the PlayStore. And the free version is from September 2018. Are you sure that the new version is already online? Is the S4 watch supported? Hi Werner, Locus Map Pro Watch is not on the Playstore but in Galaxy Apps Store. Okay, my collegue has found it and installed. What is the now following procedure in Locus to activate the communication and to send maps to the Samsung S4 watch? My collegue tells me that nothing happens and that nothing is to be seen in the menu system. if you have Samsung Galaxy Watch or Samsung Gear S3 (there is no Samsung S4 watch so I can’t say for sure, which one you mean, but it should be the same) then after installing the add-on from the Galaxy Apps store the Locus Map should appear at the end of the system menu. Just go to the very last screen of the menu and it must be there, if it was installed correctly. If there is any problem with communication in Pro version I recommend to uninstall Locus Map Pro application on your phone and then install it back again . Hope that helps. When uninstalling Locus ALL maps on the SD card will be killed. Okay, after re-installation of Locus the communication with the watch works and the map is sent. Super! Thanks! Ah, yes. The S4 is called Samsung Galaxy Watch now. It seems that there occured a problem during installation so my collegue has to re-install Locus again. And thank you for that great program which is clearly the best of all which I have tested (and I have seen a lot)! Toto by malmať zo zákona každý skialpinista, turista…. Zachránilo by to viacživotov ako pieps! Hovorím z vlastnej skúsenosti, nejednej! Ďakujem Vám za tento zázrak! what Samsung watch model do you have to be sure? The add-on is available through Galaxy Apps store on Samsung Gear S2, S3 and Sport and Samsung Galaxy Watch. There is no need to install anything other than Locus Map itself from Google Play. Locus Map Watch add-on on Google Play is intended for Wear OS (i.e. Android Wear). Hi, both versions, Locus Map Free Watch and Locus Map Pro Watch are on Galaxy Apps. And what about very popular and powerfull Garmin watches ? Really ? That sounds very good ! Další možností je vysypat dočasnou paměť aplikace Samsung Accessory Service, kterou máte v telefonu, pak na telefonu restartovat Locus Map a následně restart appky v hodinkách. Dobrý den, máte v telefonu nainstalovanou odpovídající aplikaci? Tj. pokud máte v hodinkách Locus Map Free Watch, je potřeba mít v telefonu Locus Map Free.